Jim at Jimmy’s HQ with Esme co-founder Veronika Lovett. 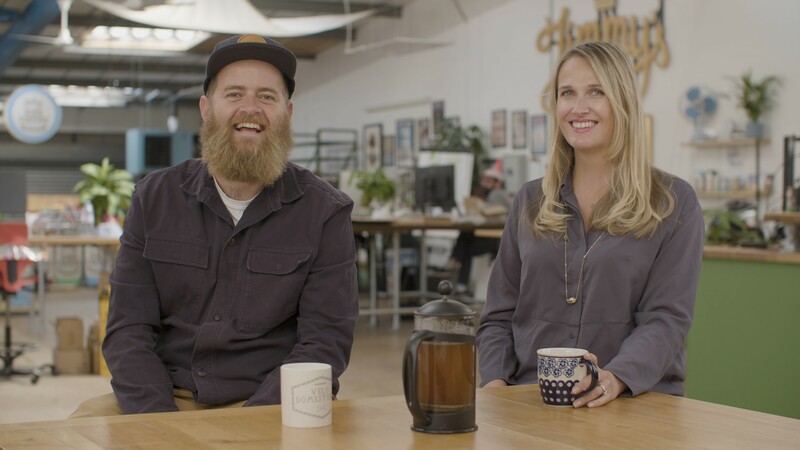 Well-known Christchurch based company, Jimmy’s Iced Coffee, has teamed up with Esme Loans, to help them create content that showcases their brand, and highlight the services they offer to small businesses. We spoke to Jimmy’s co-founder, Jim Cregan, to find out what drew him to working with Esme, and learn about some of the challenges he faced when starting his own company. What is the main thing you hope to accomplish through your partnership with Esme? Esme got in touch with us, so we could create some content together. They wanted us to showcase Esme as a brand, and as a company that can help if you’re a small business that needs cash. You don’t have to go to a big high street bank and get turned away. If it wasn’t for our folks, we wouldn’t have been able to start Jimmy’s. We’re happy to say we’ve been able to pay our parents back in full. Now, luckily, people like Esme allow you to access money quickly, which is great. It’s refreshing to see Esme loans doing their thing – it gives people a good stab at starting a business, and means they can crack on doing the stuff they want to do. Jimmy’s is currently involved in a campaign with Esme, to take the stigma out of borrowing, and help businesses understand how obtaining funding can help reduce stress while scaling. You can watch Jimmy’s video here. What was the most daunting hurdle when you started Jimmy’s? I remember standing in central London at 5 o’clock in the afternoon, and thousands of people were pacing around like lunatics. Then I spotted a corner shop and thought to myself, “how am I going to get my product in a store, and how will I tell people about it?” I had no idea where to start. I ended up reaching out to the former CEO of Red Bull, Harry Drnec, who was a great help. We’ve never built anything like this before, so we have nothing to compare it to. But, we’re still alive, still kicking and still growing, and that’s good enough for me. What advice would you give to new start-ups and budding entrepreneurs? Take a day or two, if you can, to think about whether you really want to do it, and whether you have it in you to go for it. It’s exhausting. People have this idea of what an entrepreneur should look like, and it’s all b******s! Entrepreneurs don’t have to be fit and healthy and eat flaxseed, but they do need to have the energy to go for it, 24/7. Ask yourself: Is my idea good enough, and am I the right person to make it work? Jimmy’s Iced Coffee is available to buy in Tesco, Sainsbury’s, Waitrose, BP, Boots, Morrisons, M&S.